The political right has become strongly identified with a vocal Christian base. The left is likewise identified with a strong secular/humanist element. Despite such disparate starting points, both of these approaches agree that love and service of humanity are among their loftiest goals. Which is pretty funny, because they absolutely loathe one another. And neither group sees the irony in it. Consider the President. I know people who think Barack Obama has never done anything right. I know others who think he’s never done anything wrong. Partisans of both views see themselves as perfectly logical, even brilliant, in their analysis of the man and his presidency. I mentioned in a recent post the idea that we should be open to listening to “reasonable viewpoints.” The alert reader should have questioned how we might judge reasonableness. Here’s a possible starting point: if you view a problem, any problem, in a binary fashion, then you’re out. You may be nice to puppies and children, but for the specific problem at hand you are useless for intelligent conversation. The problem is, that criteria eliminates a lot of us, on way too many topics. When we have become absolutely convinced of a viewpoint, we have essentially declared that we will never re-examine it. When we say we know, what we are really saying is that we don’t want to know. So knowledge without some doubt becomes a kind of stupidity. For instance, there are people who say they ‘know’ there is a God. I will not dispute that they know it, I will simply say that those people have no use for faith. As I am putting my child to bed, I do not need faith that she is OK, I can see it. But I need faith when I let her try anything that carries a risk (everything does) and as I gradually let her venture out in the world. I have no knowledge of what will happen, and so I rely on faith: faith in her judgment, faith in the probabilities, faith in the way life is and has always been, and faith, perhaps, that something or someone that I can’t understand will look out for her. So we only need faith if we don’t have knowledge. That is how the religious, paradoxically, become faithless. Faith is the harder path, the one of belief without knowledge. This is not only important in theology, it is also true in politics, business, and science. The most powerful observer is the one who stays alert for the unexpected. My experiences in emergency medicine have made me all too aware of this. I read the books, but diseases do not. I have seen patients die because their symptoms did not resemble descriptions in the books. On a few occasions, I have seen patients with unusual symptoms saved by a physician who forgot what the books said, and analyzed the situation anew. As I noted this is one of the strengths of many US soldiers. Those are the rarer problems however. From my limited knowledge, most lawsuits occur not because a health care provider did not know their basic medicine. They seem to happen because the practitioner wouldn’t listen. The patient or someone else — someone who was not an ‘authority’ — tried to tell the doctor, nurse or technician a critical piece of information, and they just won’t listen. Instantly the clouds disappear and all that remains is the smell of incense. The rabbis get up from the floor, brush the dust off their clothes, and one of the ten says, “OK, OK.
That is what religion looks like. If you are completely religious, if you know you are right, God Himself cannot change your mind. You are that arrogant. You many think my comment ridiculous, but theologians (and experience) tell us that divine whispers come from all sources, including the simple, the poor and the weak. If we already know what the authorities say — preacher or professor — and become too sure of what is true, we will miss them. But if we are faithful, if we practice the humility that is essential to almost all theological approaches (and should be part of scientific and political approaches), then we can we admit that we do not know, only that we believe. And then we are open to learning. Recently I read a comment by someone complaining that there are 1400 religions, and each one claims it is correct. My response is, it’s not a problem that they all think they are correct. The problem is when they are absolutely sure everyone else is wrong. Which is equally true of political and scientific positions. Faith means that we have beliefs, but are still open to learning. It means we are open minded. And why would any Christian or humanist, Republican or Democrat, American or foreigner – or any educated person anywhere, on any topic – choose to be close minded? 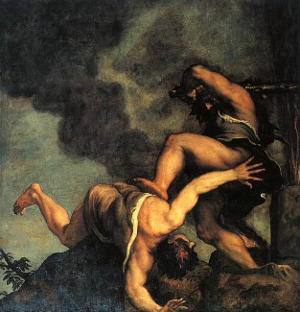 Titian’s Cain & Abel, courtesy Wikimedia.org.